While at the Evergreen Aviation Museum in McMinville, Oregon (highly recommended) I noticed this small gasoline engine on display. 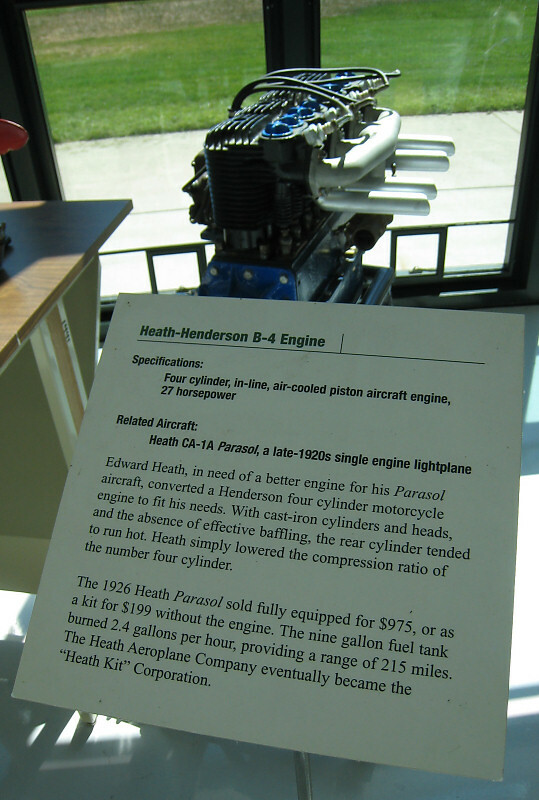 It combined several of my lifelong interests: aviation, historical aircraft, motorcycling, historical motorcycles and something from my youth, Heathkit. When I was nine my dad, at the behest of and only as a result of the constant cajoling of my mom, and I assembled a Heathkit AM radio. That project was where I learned how to solder, what a resistor and a transistor were, and how, if you followed the directions carefully, you could make just about anything from a Heathkit. And typical of a Heathkit, that AM radio had the best reception of any radio I’ve ever been around. From its perch on top of my night stand I carefully turned the analog tuning dial in as tiny increments as my small hands could muster. Late at night, as the rest of the neighborhood slumbered, I wandered the airwaves, seeking out frequencies from far away. While WHO, “1040 on your AM dial, The 50,000 watt clear channel voice of Iowa; Coast to coast, border to border, and then some,” being only 50 miles away, came in loud and clear, the far away stations from Cincinnati, Little Rock and even Pittsburgh would drift in and out as they bounced their way to me off of the ionosphere. Directly below me in the basement was my paper mache model of Cape Canaveral and the projected Apollo mission landing craft touchdown area of the moon. They were connected by an overhead string so the various Revell plastic models of the mission components could fly back and forth. Thus, using the astounding power of young boy rocket sounds, each step of the mission was played out hundreds of times with my best friend, Tom Jones. My Tom Swift books and that diorama were as close as I could get to space, except for my radio, where the magical sounds and voices came floating through the ether, bouncing off the lower edge of space itself. Each scratchy, static filled song, each wavering announcer’s baritone voice, each late west coast baseball game carried with it a tiny bit of space travel. My Heathkit AM radio was my connection with the cosmos. Those many late nights scanning the AM dial, searching for far away places, fed directly into my lifelong search for discovery, exploration and adventure. And there, on a sunny day in September, it all came flooding back. Who would have ever guessed that long before he made radios, Edward Heath was making airplanes. And using motorcycle engines for power.